Today, we are proud to announce the start of a new project for this coming year. The ambitious project is an adventure golf to be built in Squamish, British Columbia. For those who are not familiar with our local geography, Squamish is near Whistler, the site of the recent winter Olympics. It is about two hours drive from our place in Yarrow. 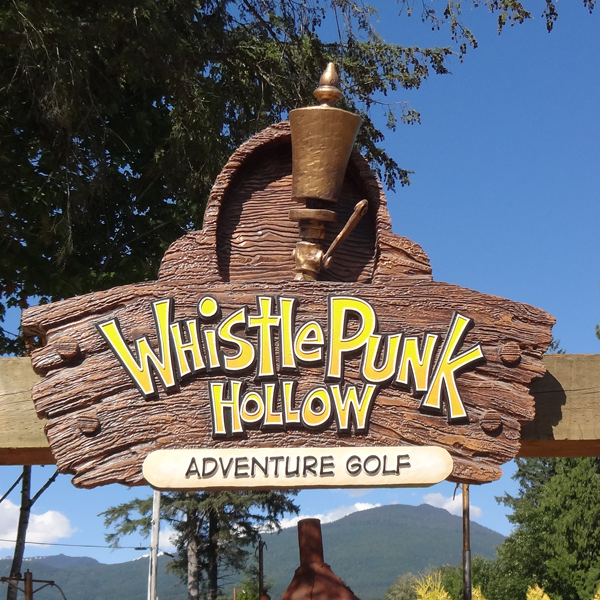 Back over a decade ago when we were planning our own Giggle Ridge Adventure Golf, we seriously considered the name WhistlePunk Hollow. A whistle punk was the fellow who worked near the steam donkeys, operating the steam whistle to signal his fellow workers that the steam donkey was about to pull some logs from the woods with cables. The adventure golf was of course to be built with a logging theme. We didn't use the name back then but we sure liked it and filed it away for possible use in the future. Fast forward to recent weeks... Our new clients, Janice and Jeff Kirkman from Squamish contacted me to design an adventure golf for their campground. They come from a logging family and wanted the adventure golf to carry this theme. 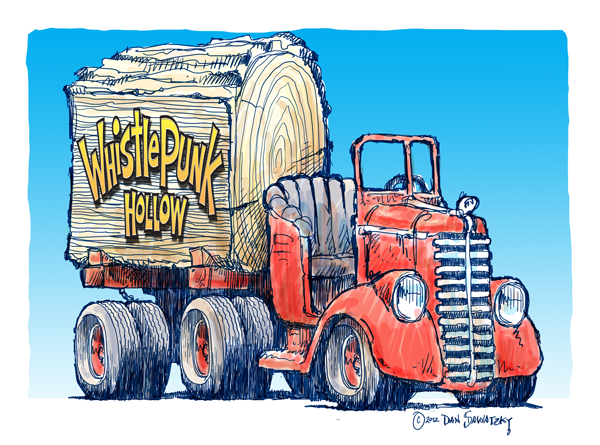 One of the names they suggested was WhistlePunk and we added the Hollow part. Then it was time to begin the design concepts in the proper historical period. The first drawing was of the primary train feature. I posted the drawing of the locomotive a while ago but here it is again with the logo on the log. The eighteenth hole will of course feature a steam donkey, the giant wood-fired steam powered machine used to pull the timber from the woods in the days of old. An old logging truck also had to be a part of the golf, perfect for photo oppotunities for every group to play the course. There are of course many more drawings and designs. In the next weeks and months I'll show them here as we switch from planning mode to building these latest creations. This is going to be a fun and challenging project! Another trade show is history.